Entry is free but we rely on donations to keep open so please be generous - Please see the Donations page for details. 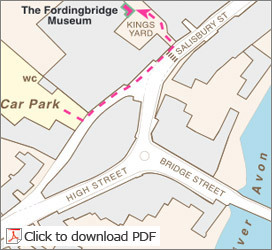 ~~Fordingbridge Museum reopens its door for the summer season on Tuesday April 9th after a winter of frantic activity. Volunteers have been beavering away dismantling some exhibits, assembling others, cleaning, cataloguing and planning. We have new exhibits for you to look at and some new technology for you to play with. We also plan a special event to coincide with the exhibition on Augustus John at Salisbury Museum.